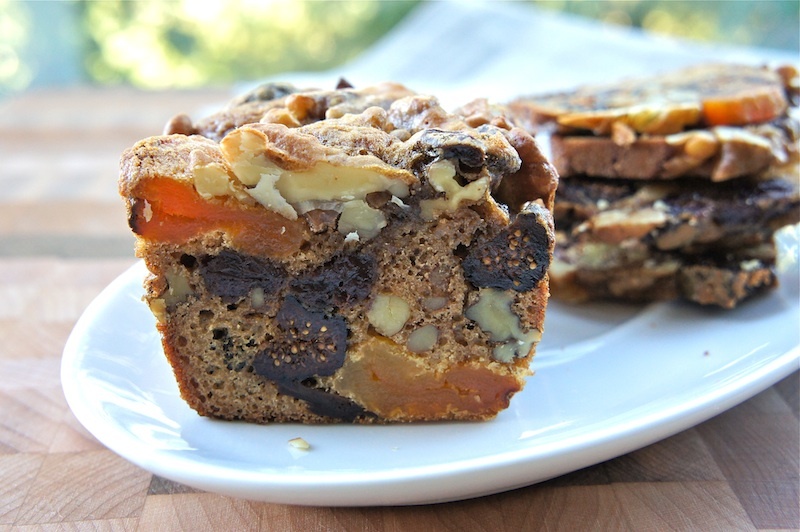 If you love munching on healthy dried fruits and nuts mix, then you should try baking this scrumptious Dried Fruits and Nuts Loaf. 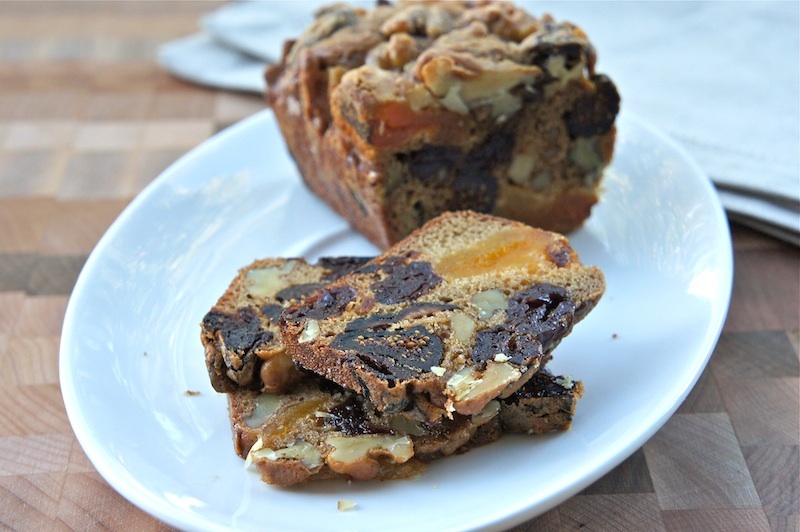 I had baked the loaf with a mix of dried apricots, cherries, figs, and walnuts. Fret not, if any of my mix does not work for you, feel free to substitute or create your own mix using your choice of dried fruits and nuts. Thinly slice the loaf and enjoy it as an energy booster, snack, or serve with a cheese platter, as suggested by the author of this baking book. Position the rack in the lower third of the oven and preheat the oven to 300˚F. Spray loaf pans with vegetable oil spray or line the bottom and sides with parchment paper. In a large bowl, whisk the flour with the baking soda, baking powder, and salt to combine. Add the brown sugar, all the dried fruit, and the nuts and mix thoroughly with your fingers. Set aside. In a small bowl, beat the eggs with the vanilla extract until light. Pour the egg mixture over the dry ingredients and mix well with a wooden spoon until all the fruits and nuts are coated with batter. Scrape into the prepared pan(s). Bake until the top is deep golden brown and the batter clinging to the fruit seems set, about 50 to 55 minutes for mini loaf pan, 1 hour for smaller loaves, 10 to 15 minutes longer for a large loaf. Tent the top loosely with foil if the cake appears to be browning too much. Cool completely in the pan(s) on a rack. When completely cool, remove the cake (bar) from the pan(s). The cake (bar) keeps, wrapped airtight in foil or plastic wrap, for several weeks at room temperature or at least 3 months in the refrigerator. It can also be frozen for at least 6 months. To serve, cut into thin slices with a sharp heavy knife. this is healthy recipe....good for breakfast! This sounds great - solid and stodgy, which is perfect for winter, but tasty and fruity. Yum! Angie..this is yummy so fruity and nutty. I want to bake this too :))) Thanks for the recipe .